If you have ever seen a great cowboy western movie, you know that the hero never rides alone. The protagonist on horseback may be made to look tough and appear like a loner, but almost every time a story of the old west is told there is friend riding closely at the hero’s side. Golf once had a hero cowboy who could have been in a movie like that. His name was Mike Strantz and the man that rode at his side is Forrest Fezler. Strantz was a visionary course designer whose work has impressed the golfing world increasingly more as time has passed since his death. Strantz was an artist. He was widely known for his hand-drawn sketches that served as the blueprints for his courses. He created dramatic golfing landscapes with his imagination and then built them with his own callused hands. Mike Strantz looked the part of a cowboy too. Mike had a handlebar mustache and long dark hair that fell over his tall build. Much like the hero cowboys of the silver screen, Mike’s trusted friend Forrest rode with him on his golf design adventures. Strantz’s partner and friend Forrest Fezler is best known for being a PGA Tour player who accomplished two impressive feats at the U.S. Open. In the 1974 Open, famously remembered as “The Massacre at Winged Foot”, Fezler finished alone in 2nd place behind winner Hale Irwin. 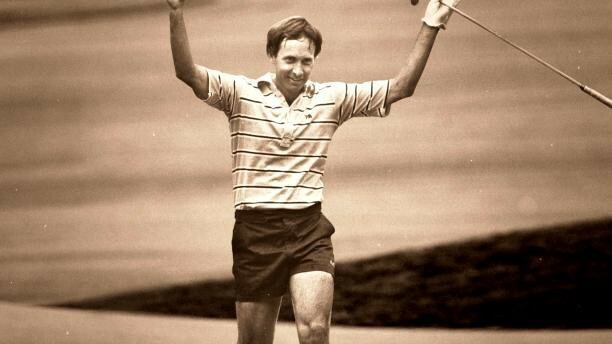 Nearly a decade later and much to the chagrin of the USGA, Fezler’s fame peaked again at the 1983 Open when he wore shorts up the 72nd hole. 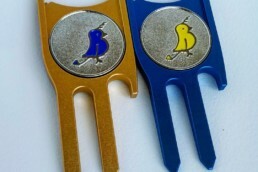 Fezler had an impressive golf career by most standards, but he is less known for being the other half of the revolutionary Maverick Golf Design Company. Mike Strantz and Forrest Fezler became close friends when the two were brought together to work on a development project in Tallahassee, Florida during the mid 1980’s. Their friendship led them to each other again when Mike was ready to start his own golf design company. Mike and Forrest embarked on a decade long design career together that produced some of the most inspired and artistic work of their time. Cowboy western movies are usually pretty predictable. The hero saves the day while those around him are faced with danger. Often times it is the close friend and riding companion that falls in the shootout and inspires the hero to ride on to savior status. That’s not how the story of Strantz and Fezler goes. In their story, the lead cowboy doesn’t make it out of the fight. In 2005, Mike Strantz lost his battle with cancer. The cowboy didn’t get to ride off into the sunset in search of the next adventure. Instead, he watched his final sunsets with his close friend at his side while they built his magnum opus. Mike Strantz leaned on Forrest Fezler to help him deliver one last work of art to the golfing world. Today, over a decade since Mike saw his last sunset over the Monterey Peninsula shore, Forrest can be found keeping that course true to Mike’s vision. Mike Strantz was known as the maverick of golf design. He went all in on every project and he left a little piece of his spirit in every hole he designed. The one person who understands that best is Forrest Fezler. Felzer is a maverick in his own right and that made him a perfect partner for Mike Strantz. This is their story. It’s a story about how two mavericks came together to help change golf design forever. It’s also a story of how one of those cowboys still rides in remembrance of his friend. Mike Strantz was an artist at heart. Like all great artists, Strantz had to find the medium that worked best for his special talents. That often requires a unique journey in which an artist must work through the battles of life and the maze of creativity to find the proper way to express themselves. Mike Strantz’s journey was no different. Strantz enrolled at Miami University of Ohio in 1973. 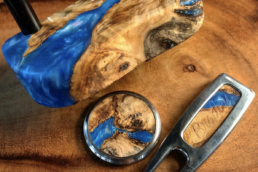 He began there in a studio art program as a way to shape his artistic skills. Somewhere during that discovery process he decided that the life of a starving artist was not for him. Soon another scholastic endeavor called him to Michigan State University. Strantz went to Michigan State to pursue a degree in Turf Grass Management. His intention was to become a golf course superintendent. Strantz, the artist, would work on a medium of grass. Opportunities would soon come knocking for Strantz. In 1979 the Inverness Club in Toledo, Ohio was preparing to host the U.S. Open. Strantz got a call from the club to join them in the preparation efforts. 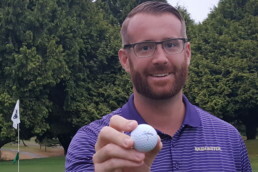 Tom Fazio was brought in to lead the renovations at Inverness and a young Mike Strantz was quickly noticed by the famed designer for his hard work and talents. Two days after the U.S. Open ended, Fazio invited Strantz to join his prestigious design firm. Strantz’s career in golf design began to accelerate quickly through the work afforded him while under the umbrella of the Tom Fazio design team. During his time on the Fazio staff, Mike Strantz built thirteen golf courses for the famed designer. Between 1980 and 1988, Strantz oversaw the building of some of Fazio’s best layouts. Tom Fazio would design a routing and a vision for the course then Mike Strantz was tasked with making it become a reality. Mike Strantz learned by doing. While working for Fazio, he learned how to shape a golf course from the ground up. The Mike Strantz style that he would become known for later was largely crafted during those developmental years working with Tom Fazio. The list of courses built by Strantz for Fazio is impressive. It includes places such as the courses at Wild Dunes Resort, Osprey Point at Kiawah Island Resort, Lake Nona Golf Club, Black Diamond Ranch, and Wade Hampton Golf Club. Many of these works have cemented themselves in “best of” lists including the various “Top 100” lists. Tom Fazio’s best designs of the 1980’s were shaped by the hand of Mike Strantz. However, the project that shaped Mike Strantz’s future the most may have been one of the lesser know variety. In 1986 the Tom Fazio design team was brought in to Tallahassee, Florida to build a golf course for a local developer there. That developer was a former PGA tour winner named Forrest Fezler. Forrest Fezler had a vision of a beautiful golf course community that would be inspired by Augusta National. He hired Tom Fazio and his team to help make that a reality. Like the other prominent Fazio designs of that decade, it would be Mike Strantz who stayed on the ground in Tallahasee to build Fezler and Fazio’s vision. Forrest Fezler had a passion for golf and was in love with property that Golden Eagle Country Club would be built upon. Unlike some golf developers, Fezler was quite engaged in the build out of his course. 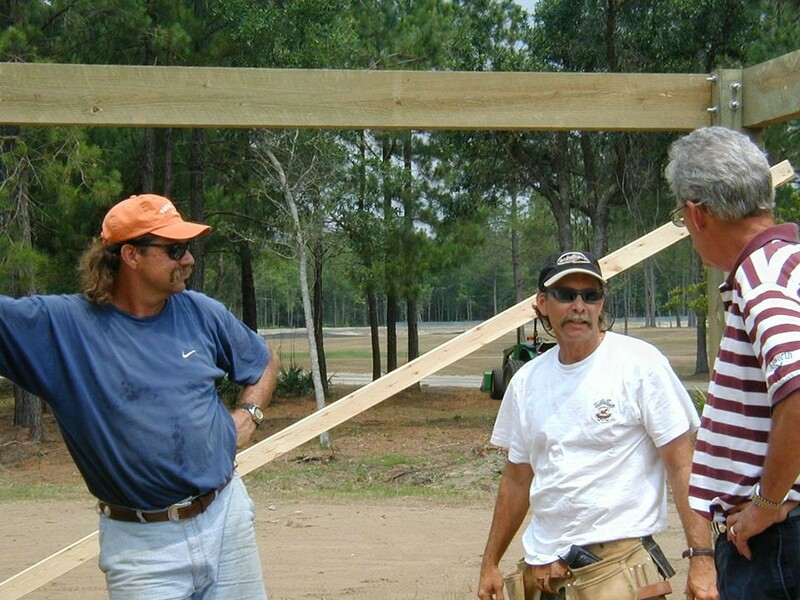 Mike Strantz and Forrest Fezler were brought together to build a golf course in Tallahassee, but the spark of friendship they found while moving dirt together there helped change the trajectory of golf design for a generation. Forrest Fezler grew up a California kid in San Jose. He learned the game and spent his days sketching golf holes when he wasn’t playing. Fezler played college golf at San Jose City College and went on to win the California State Amateur in 1969. He turned professional shortly after gaining his card for the PGA Tour in 1973. Fezler was a breakout in his first year on tour. He came in second place three times that year en route to winning “Rookie of the Year” honors. Fezler’s first moment in the spotlight came at the 1974 U.S. Open. Fezler managed his way through the “Massacre at Winged Foot” to a +9 total, two shots behind winner Hale Irwin and good for a solo second place. Coming down the stretch Fezler made some incredible up and downs for par to keep the heat on Irwin, but came up just short of victory. With an impressive performance at the national open and an increasingly positive trend in his playing, Forrest Fezler had the whole golfing world in front of him. Fezler went on to have great success on the PGA Tour, but never quite found a consistent winning stride. Fezler recorded over thirty top 10 finishes on tour with eight of those being runner-up claims. He notched one win on tour at the 1974 Southern Open, a few months after his run at the U.S. Open. The playing career of Forrest Fezler ended early. Fezler suffered torn ligaments in his left wrist and also faced being a distant father to his wife and kids. During his time on tour, players had to stay in the top sixty on the money list and time off was a luxury few could afford. He retired from the tour at age 34, but not before making one last statement on the national stage. The 1983 US Open was held at fabled Oakmont Country Club and Forrest Fezler knew it would likely be his last attempt at the championship that first made him famous. Fezler, who had been disgruntled with the USGA over a slow play penalty at the 1981 Open, decided to make a small protest on his way out. Forrest Fezler went into a portable bathroom just off the 18th hole of Oakmont and changed into shorts, wearing them all the way up the 72nd hole of the championship. As Fezler was preparing to exit the stage of professional golf, he made one last statement that people still haven’t forgotten. Forrest Fezler strides up the 72nd Hole of the 1983 US Open while wearing shorts. When Forrest Fezler wore shorts at the U.S. Open it appeared to be the end of his golfing story, but the most interesting and impactful chapters were still to be written. Fezler went through some evolution in his life including a divorce and stints as a club professional. Those changes reshaped Fezler’s life in challenging ways, but through the fate of the golf gods they all led him to an opportunity to work with some friends and develop a golf course community in Tallahassee, Florida. Golden Eagle Country Club is a typical successful suburban country club. Members play, parties are held in the spacious clubhouse, and the home surrounding the course are of the “McMansion” variety. The club touts its Tom Fazio designed golf course as its most attractive asset and the members enjoy playing there in the Florida weather nearly year-round. What most, if not all members there, don’t know is that a partnership was forged at their club that would go on to play a pivotal role in ushering in a new age of golf design. Forrest Fezler came to Tallahassee for an opportunity to develop and own his own golf course. Golden Eagle Country Club was developed by Fezler and his friends as a quiet and peaceful suburban golf community. The property was filled with creeks and lakes and was highly suitable for a picturesque golf course to be built there. Fezler had a vision for what the course and club could be, but he needed an acclaimed architect to bring it to life. To do that, Fezler turned to Tom Fazio. Tom Fazio was in the middle of his most impactful decade as a golf course designer. The work his firm was doing was widely considered to be at the top of the industry in the 1980’s. Fazio had proven to be a gifted architect with a desirable style that was well received by the reviewers and critics of that time. Part of that was due to the many talented team members he had assembled to build his courses. The most impressive of which was a young Mike Strantz. Following suit with other successful Fazio projects of the 1980’s, Mike Strantz was tapped by Fazio to be his on site builder at Golden Eagle Country Club. Fazio suggested that Strantz would be a good fit to work with the engaged owner of the project, Forrest Fezler. Fazio had a hunch that they might get along well and that hunch turned out to be quite right. During the construction of Golden Eagle Country Club, Mike Strantz and Forrest Fezler became friends. Strantz and Fezler spent long days together under the Florida sun working through Fazio’s plans and building a beautiful golf course. Fezler was often seen on site with Strantz working along side him to build the course. The routing of Golden Eagle is said to be one of Tom Fazio’s favorites, taking great advantage of the natural features of the property. Stranz built challenging hazards and greens filled with interesting slopes. The course would go on to host a Web.com Tour event as well as numerous college and amateur tournaments. The course helped to sell many homes in the development and remains popular in Tallahassee. Despite Golden Eagle’s relative success, the project did not turn out the way that Forrest Fezler had hoped. He lost his interest in the deal when the partnerhips behind it turned sour. Lawsuits and attorney’s fees over a decade were enough to see Forrest Fezler lose Golden Eagle along with his interest in the game of golf. As Fezler was entering his mid 40’s he was again in a period of transition. Having lost out on his prized development, Fezler was briefly considering a return to professional golf and the possibilities of the Champions Tour. Instead, he reconnected with an old friend who was also going through some career changes of his own. Mike Strantz left Tom Fazio’s design shop in 1988. Strantz wanted to spend more time near home with his wife and daughters. Spending most weeks on the road traveling and working long hours, Strantz had found himself burned out on building golf courses. Strantz stepped away from his golf work, but mother nature had other plans for him. In 1989 Hurricane Hugo barreled down on the South Carolina coast causing massive amounts of damage to the region. The Hurricane also brought severe harm to the low country’s golf industry. In particular, Hurricane Hugo all but destroyed the courses at Wild Dunes Golf Resort on the Isle of Palms. Wild Dunes was the first project that Mike Strantz worked on for Tom Fazio and when the damage was assessed, the resort’s owners called Strantz to help them rebuild the courses. Strantz couldn’t help but be pulled back into the game of golf and his passion for building bold and imaginative courses. After his work to restore Wild Dunes, Strantz began to take on additional jobs in the Carolinas. He made a commitment to his wife to stick to projects that were within a few hours drive from home. That commitment and the lure of building golf courses would soon come into conflict though as Mike Strantz was seeing a rising demand for his work. That demand brought Mike Strantz together with a developer out of Myrtle Beach, South Carolina named Larry Young. Young asked Mike Strantz to step in and rework the bunkering at his new course at the Legends Golf Resort. Strantz was hesitant to reengage in design work at this scale, but his passions drew him back in. Strantz and Young worked well together. The pair hit it off and planned a new golf development in which Strantz would be the featured course architect. The resulting project was Caledonia Golf & Fish Club. The course was a commercial success and has been widely regarded as a great display of Stantz’s design talents. With the building of one course in South Carolina, Mike Strantz had elevated himself from a talented builder to a full blown golf course architect. After Caledonia, Strantz was called to Virginia to design a set of courses as part of the Tradition Golf Club development. The two courses there are commonly known as Royal New Kent and Stonehouse. While Strantz was building those courses he got a call from an old friend who had recently moved to the area. Forrest Fezler was living in nearby Williamsburg, Virginia where he was practicing and preparing for a run on the PGA Tour Champions circuit. Fezler had gotten word that Strantz was working on a large golf development project in the area and he wanted to stop by and see his old friend. Forrest Fezler found Mike Strantz working on what would become the eighth hole of Royal New Kent. The work he saw being done there blew him away. Strantz and Fezler reconnected like old friends are prone to do. The pair toured the course under construction and talked through the latest developments in each others lives. Fezler told Strantz of his plans to pursue professional golf again. Strantz gave him another route to consider. Right there in the dirt being turned at what would become Royal New Kent, Mike Strantz offered Forrest Fezler a job. Fezler recalls Strantz telling him to quit pounding his head against the wall of professional golf and join him in building golf courses for the rest of their lives. Fezler was a few years removed from losing his course in Tallahassee and he missed that side of the game. He was mesmerized by the design that Stratnz was building and longed to get back to the building of golf. How could he possibly say no. What emerged from that meeting in the dusty corridors of a golf construction site was a partnership that would produce some of the most treasured golf courses of golf’s second golden age. Two mavericks, a designer and player, came together through a bond of friendship and a passion for golf courses. Maverick Golf Design was born. Mike Strantz and Forrest Fezler were a team. Their partnership was rooted in friendship and a mutual curiosity in each other. Strantz was the visionary designer who had made Fezler’s dream come to life in Tallahassee. Fezler was the mustache wearing professional golfer who Strantz had admired in the technicolor broadcasts of the 1970’s PGA Tour. The duo knew each other well and together they knew golf courses even better. Strantz could see the possibilities of the land and Fezler could see the playability of the vision. 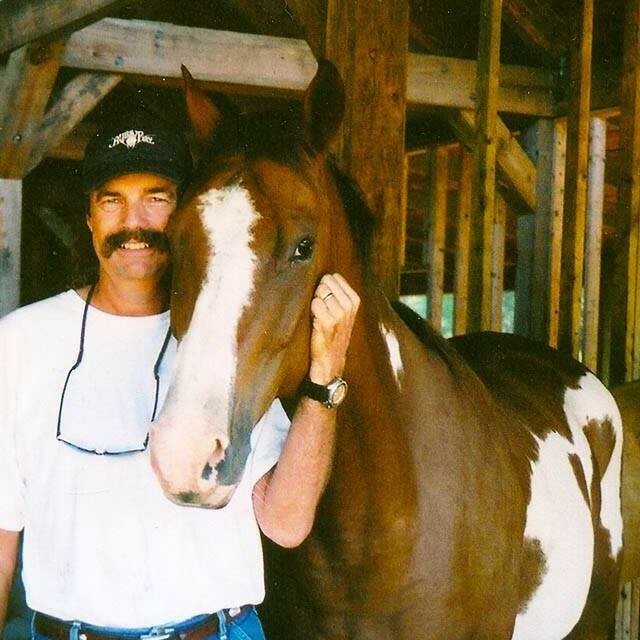 Fezler joined the crew for the completion of the Virginia courses and became a full time associate for the firm and all time best friend for Strantz. Royal New Kent and Stonehouse each received the designation of Golf Digest Best New Course in back to back years. No architect had ever received such an honor in consecutive years. 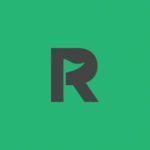 With accolades mounting and a newly strengthened team assembled, Maverick Golf Design was seeing doors continue to open. Strantz and team were called back to the Myrtle Beach area to complete the second leg of the Young family’s development there. They built a sister course to Caledonia called True Blue Golf Club. Again, Strantz delivered a course that was showered with acclaim as one of the best new courses in America. In 1999 Maverick Golf Design was hired to add a golf course to the impressive repertoire of golf near Pinehurst, North Carolina. Pinehurst is known as the cradle of American golf and is home to some of the nation’s most prestigious public courses. The opportunity to paint on the Pinehurst golf canvas is a unique one and Strantz stepped up his game to do just that. Tobacco Road Golf Club is one of Mike Strantz’s most visionary golf courses. Tobacco road, like much of Stranz’s work, is famous for its dramatic landscapes. Strantz and Fezler built a course there that blurs the definition between the man-made and the natural. Strantz, ever the artist, loved to create visually stunning golf holes that took advantage of what the land offered while also not being afraid to move some dirt. Tobacco Road is perhaps the most revered course designed and built by the mavericks. In large part that is due to the public access that is available to the course. 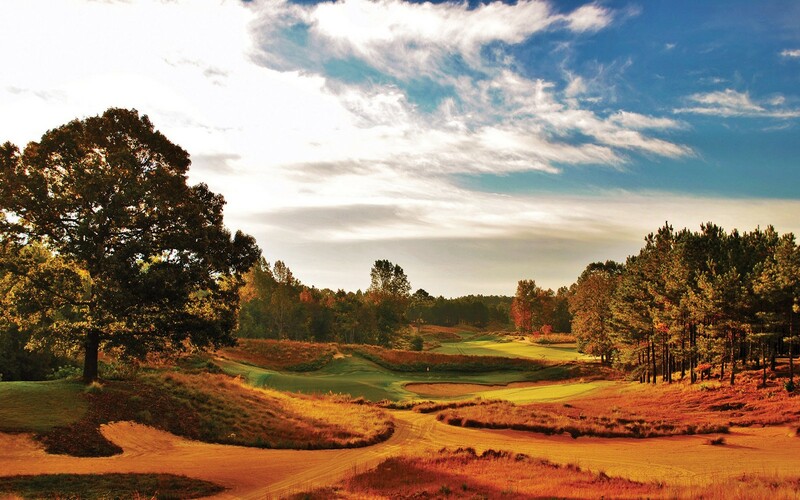 Tobacco Road is one of the most notable places in which the public can experience the marvel of Mike Strantz’s artistry. The work at Tobacco Road helped lead to Mike Strantz being named the world’s best golf architect by Golf World magazine at the turn of the century. The accomplished work and corresponding awards continued to mount for the Maverick Golf Design team. Strantz’s incredible vision was in high demand. Strantz and Fezler took their team through the construction of Tot Hill Farm Golf Club in North Carolina and then Bulls Bay Golf Club near Charleston, South Carolina. Both courses were recognized for their brilliance and creativity in design. During the design of those courses the duo of Strantz and Fezler began to find their stride. Their work was meaningful to them and the courses in which they built were widely regarded as cutting edge. The mavericks were working in tandem and delivering some of the most impressive courses of their day. When working on a course together the mavericks would be seen riding horses through the properties as construction was happening around them. Strantz would survey the terrain from his horse Scout and Fezler would ride at his side on Cheeser. The duo behind golf’s most interesting new course designs were working beautifully in concert . Together they found ways to make Mike Strantz’s art come to life. With so much activity occurring and so much success accumulating it was easy for the mavericks to overlook the details of day to day life. They were creating majestic landscapes together and the world was coming into recognition of their unique talents. In all those days on horseback and all those evenings with a sketch book in hand, Mike Strantz was seeing to his work with great success. During those years, in the prime of his life and the peak of his career, Strantz didn’t have much time to think about small distractions like a little lump on his tongue. The artist with such great attention to detail had an issue arising with his health and much like a hard headed cowboy he ignored it for too long. The calls for work kept coming in, but there were real challenges mounting for the mavericks. The coming years would bring both the best and worst of everything friendship and life have to offer. The legacy of Maverick Golf Design would be forged from tragedy and one final marvelous golf course. Continue the story by reading part two of The Maverick Lives On.